Are you ready to hear about my favorite book series? 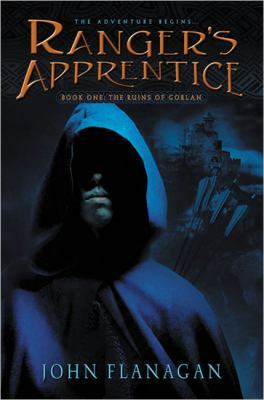 Australian author John Flanagan brings us the Ranger’s Apprentice series, which has captivated me for several years. Each of the twelve books is exciting to read the first time through, and just as exciting a second time. It tells the tale of a boy named Will, an orphan raised in a medieval castle’s ward. Come Choosing Day, when the orphans are selected for apprenticeships, not a single craftmaster chooses Will. Tears well up as his fellow wards are selected to become warriors, scribes, and diplomats, while he will become merely a farmhand. Then, Will receives the biggest shock of his life: he is selected to be trained as a Ranger’s apprentice (hence the title). The King’s Rangers are an elite and mysterious force of master archers, serving directly under the king. Their skill set includes tracking, wielding knives and bows, and vanishing into the forest with their mottled cloaks. The Rangers silently monitor the fiefdoms and watch over the citizens. Just like Batman. Though Will is apprehensive at first, he soon realizes that this life is infinitely more exciting than being a farmer. And so, for the rest of the twelve books I won’t summarize, Will and his master Halt go on all sorts of adventures spanning a variety of countries, from deserts to snowy mountains. There are many reasons why this series has stuck with me so long. Every single book is a well crafted mix of adventure, humor, and well placed sarcasm. What’s more, all of their adventures are unique storylines, deviating from a lot of cookie cutter books out there. The language is wonderfully detailed; I can recognize Flanagan’s style from other authors by the telltale ways he writes his stories. Of course, the characters all have distinct personalities, likes and dislikes, so that everyone has multiple dimensions. We readers can better understand and sympathize with their decisions. In fact, some of the best scenes in these books come from byplay between friends, and outright clashes of different personalities. Another aspect that I love about this book is how well Flanagan envisions the Ranger Corps. The common people regard them as an arcane group shrouded in mystery, a group dealing with matters more important than the peasant’s daily lives. When we follow the life and adventures of Will, it almost feels like we have become a part of the tight knit group, and we familiarize ourselves with each person. This is the reason I keep rereading these books— I’ve become emotionally attached to fictional characters! So, when you’re ready to dive into this fantastical world of knights and villains, read through the Ranger’s Apprentice series. Become a part of the King’s Rangers. The Ranger’s Apprentice series can be checked out from the Mission Viejo Public Library. Posted on July 12, 2015 by Anmol K.
In this class, the students excavate remains from Earth’s ancient, abandoned cities. Jarra’s skills are tested when an unstable, ancient skyscraper traps another research team under it. Having practiced excavating rocks (called “tagging” in the novel), Jarra is the hero of the day when she helps dig out the team. Her rescue has put her into the limelight of her classmates, which is not something she needed for her plan. To see if her plan of tricking her classmates worked, I suggest reading this unique book. I picked up this book because I found the plot intriguing. Interested in how Jarra would trick her classmates, I also thought that it would be cool how her classmates would eventually react. The setting was another aspect of the story that I enjoyed. Even though the story takes place on earth, the explanation of how their world was built is amazing. The only aspect of the book I did not like was were the class excavations because the author went a bit to deep with the history and science of the process. Well wrapped at the end, I cannot wait to start the second one and see what Jarra has in store for her life. 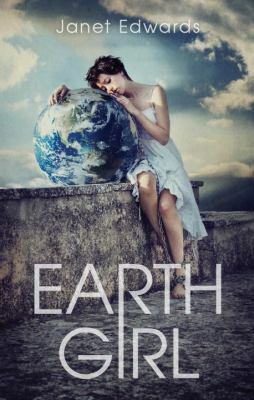 Earth Girl is available for check out from the Mission Viejo Public Library. Posted on July 3, 2015 by Maya S.
The American Civil War took place from 1861 to 1865 and pit the Northern and Southern States against each other, as shown in this novel by G. Clifton Wisler. Boys from the age of 13 were enlisted to make money for their families. There were a lot of economic problems at the time for the United States (who, due to the war, weren’t that amalgamated). People were struggling to survive, and many barely even had enough food. Since the war was to abolish slavery and the story is told from the side of Mr. Lincoln, there is little racism. Willie, a young boy of the age of 11, had been working in his family’s business his entire life: mending clothes (mostly army uniforms). But, he was always interested in war. Willie didn’t realize any of the devastation and blood many encounter. Much to Willie’s delight, an army general comes to town offering a modest sum of money for men to enlist in his regiment. The general vaguely recognizes Willie and calls him over. The man taught Willie a few of the drum patterns for the army calls some time ago and was impressed with Willie’s talent. The general gives Willie a couple coins. 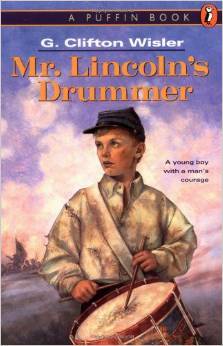 As Willie walks home, he thinks what it would be like to be in the army, being a drummer. When he arrives home and shows his mother the coins and asks, “Can I enlist to be a drummer?” There is silence. “Danger Zone” by Kenny Loggins, I thought, accurately summarizes the reaction by Willie’s mother to his “whimsical” question. They both disagree. They need a third opinion. Waiting, painstakingly, for his father to come home, Willie dreams of the Army and of the drumbeat of his own, courageous instrument. Then, after hours of discussion between his mother, father, and himself, the family settle on a plan whereby father and son would enlist together under the condition they must stick together. However, when the father and son exit the train from their town, they are separated. Willie has to live his life as a drummer mostly by himself. Throughout the story, Willie sees death of his own friends, converses with a Reb, and takes a fall himself. At the end of the story however, awarded with pride, I thought of the song “Raise Me Up” by Josh Groban because that is how Willie feels. He doesn’t believe himself to be a hero. He thinks that his parents, the general, and his friends pushed him too hard, and he failed. I would rate this book a 6/10 for its lack of power. The story itself was good, but I wasn’t drawn in.